Reinforcement of concrete with steel is being done for more than 100 years. It is the time proven match for reinforcing concrete structures. At the very beginning of technology simple rounds and squares were used. Sometimes later rails and profiles were also used. The production of specific reinforcement steel started sometimes in 1930s.It was realized that beside the tensile strength, bond between steel and concrete plays an important role in terms of load transfer. Presently the global annual production of reinforcement steel (Fig 1) is more than 210 million tons. Reinforced concrete structure is designed on the principle that steel and concrete act together to withstand induced forces. The properties of thermal expansion for both steel and concrete are approximately the same. This along with excellent bendability property makes steel the best material for reinforcement. It bonds well with concrete. Steel is strong in tension at the same time being ductile enough to be shaped or bent. For a long time steel bars in as rolled condition were being used for reinforcement purpose. Yield strengths of 350 to 400 MPa were achieved in carbon manganese steels by keeping C to around 0.35 % and Mn in the range of 0.9 % to 1.45 %. But due to ingot casting there was segregation of manganese which was causing brittleness of the steel at the place of segregation. At this stage micro alloying of steel was introduced to achieve the yield strength of the steel by micro alloying it with vanadium, niobium and titanium. Since the carbon content also got reduced these rods were weldable. But the advantage was got negated due to higher cost of these steels. Sometime during 1940s ribs were introduced in the reinforcement steels. Both straight long ribs and cross ribs were introduced to provide reinforcement steel better bonding with the concrete. These ribs were produced during rolling itself. This has resulted in saving of lot of fabrication work on the reinforcement steel. Next important step in the development of reinforcement steel was cold twisting of the steel after rolling it in the mill. The cold twisting gives to the longitudinal rib a spiral shape. The reinforcement bars produced by this method was popularly known as Torsteel or CTD (cold Twisted Deformed) bars. In these bars the strength of the steel is obtained through cold working and not by the adjustment in the chemistry of the steel. The process of cold working of reinforcement steel is a mechanical process which involves stretching and twisting of reinforcement bars rolled from mild steel, beyond the yield plateau, and subsequently releasing the load. For many years these bars were dominating the use of reinforcement steel. Because of reasonable carbon in this reinforcement steel, this steel is weldable. The disadvantage associated with the reinforcement steel produced by this process is as follows. The cold twisting process is a batch process and the properties of the reinforcement heat differ from bar to bar. The cold twisting of the steel has a cost involved in it. The cold twisting process has adverse effect on the steel ductility. The process breaks the protective blue oxide; it exposes the surface of the reinforcement steel to corrosion. During late seventies process for manufacturing reinforcement steel by Centre de Rechaerche Metallurgiques (CRM) Belgium and Thermex from HSE Germany was developed. This process is described in detail in a separate article whose link is http://ispatguru.com/quenched-and-tempered-reinforcement-bars-quenched-and-tempered-reinforcement-bars/. Good strength, bond with concrete, thermal expansion characteristics (similar to concrete) and bendability are main advantages of reinforcement steel as a material for reinforcement concrete. Reinforcement steel is the most versatile alloy which meets the following optimal reinforcement requirement for concrete. Load transfer is performed from concrete to reinforcement and vice versa over a limited development length. Reinforcement steel has a high modulus of elasticity in order to gain a high degree of stiffness for the construction as a whole. The interaction between reinforcement steel and concrete is free of disadvantages in terms of chemical and physical disadvantages. The reinforcement steel has the appropriate delivery forms, shape and length which fit with various construction activities. Reinforcement steel provides spacious interfaces in a great variety and in a large range to match the calculated value of the reinforcement section. The reinforcement steel is flexible and easily bendable to match with the shape of the construction. The steel has a high ductility property. The reinforcement steel is capable of jointing by overlap, welding and forming mechanical connections. The reinforcement steel resists without significant deterioration of damage the rough conditions during transport, storage, bundling and placing on construction site. Minor damage if it happens does not reduces significantly the performance characteristics. Reinforcement steel provides to the construction a sufficient fatigue resistance because concrete is not resistance to dynamic loading. Reinforcement steel resist shear forces as well as tension and compression forces. Reinforcement steel offers its performance characteristics in a sufficient long range of temperatures. Its behavior is predictable in extreme low and extreme high temperatures. The quality level of reinforcement steel absorbs minor imperfections which normally happens during the construction activities. Reinforcement steel is a durable material which will provide many years of maintenance free life to the concrete structures. However it is seen that in hostile environments even good quality concrete will not necessarily protect reinforcement steel from corrosion for the long design life (typically 75 to 120 years) currently specified for many reinforced concrete structures. To reduce and prevent the corrosion of reinforcement steel bars in concrete several methods are employed. Some are related to the making of concrete while the others are related to the quality, composition and coating of steel used in the making of reinforcement of bars. The choice is normally made based on the cost. Coatings employed on the reinforcement bars are i) hot dip galvanizing ii) fusion bonded epoxy coating and iii) stainless steel cladding. 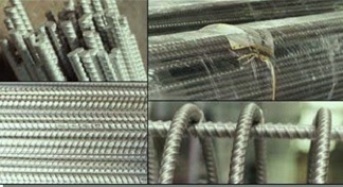 Reinforcement bars of stainless steels are also being used. Designers have choices for specifying the appropriate reinforcement steel material for concrete structures. The most commonly used reinforcement steel material is uncoated carbon steel, which has very little or no corrosion protection other than the concrete mix design, surrounding environment, and depth of cover. Fusion bonded epoxy coated and galvanized reinforcement steels are also specified, but each has its own inherent drawbacks. Fusion bonded epoxy coating provides good corrosion resistance but is damaged easily during bending and installation. Chips or cracks in the coating can contribute to corrosion. Protection from ultra violet light is required, if the coated rebar is stored outside for more than two months. In case of galvanized reinforcement steel field bending results in a breach of the coating at bend locations. The 30-year performance of galvanized reinforcement is marginally better than that of conventional uncoated carbon reinforcement steels. The use of stainless steel in the construction started in 1960s and since then its uses is steadily increasing despite its higher cost. There is also production of high strength ( Mpa 600 ) rebars ( bainitic structure ) simply by air cooling . Are u having any details ? An excellent piece of information on reinforcement bars and their applications. It is to add that, IS:1786-2008 had added several high strength grades including rebars for seismic resistance and Fe-600 with 600 MPa. We at SAIL are producing these rebars. We have developed the seismic resistant rebars with excellent UTS/YS ratio and high uniform elongation as well as total elongation. I have published/ presented several papers on these developments which also includes corrosion resistant rebars. I am also representing SAIL in BIS Committee on this product. Very good information on Rebar. There are lot of new developments in Rebar is going on like Cryogenic Rebar(Krybar from Arcelor Mittal) for low temperature application.